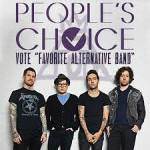 Fall Out Boy perform Centuries during the People’s Choice Awards from their album American Beauty/American Psycho. Fall Out Boy performs Centuries during the Peoples Choice Awards Show promoting their album American Beauty/ American Phyco. 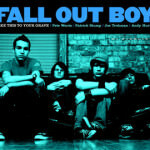 Fall Out Boy perform Young Volcanoes from the album Save Rock and Roll on Jimmy Kimmel Live. Fall Out Boy Performs "Young Volcanoes"
Fall Out Boy performsCenturies from their album Centuries on Jimmy Kimmel Live. Fall Out Boy accepts the ALS Ice Bucket Challenge and nominates Gabe Saporta and New Politics. Fall Out Boy wins People’s Choice Award for Favorite Alternative Band. Fallout Boy performs My Songs Know What You Did in the Dark (Light Em Up) at the Victoria Secret Fashion Show from their album Save Rock and Roll. Fall Out Boy performs Alone Together on The Ellen Show to promote their album Save Rock And Roll. It’s been about ten years and for a better part of that we were working constantly. We were tired of the grind. We would play 500 shows in a two-year period, you know? And the other thing — the fact that we weren’t all into the same kind of music made the band kind of cool, but it’s very strange when it’s expected that you be monogamous with that band for the rest of your life. Andy Hurley is a metal drummer, first and foremost, and it was really awkward for him to think that he’d never play metal again. It was awkward for me to never sing R&B music again or to never play drums myself. Everybody had their own reasoning. It’s not creative difference. It’s just, like, creative wanderlust. We mix the influences in a way that sounds new and complete. But they all can’t work. For instance, I love heavy metal. But for me to insert Randy Rhoads licks into Fall Out Boy’s music, it’d sound crazy. So I hold back, which creates a cool kind of tension. I think casual listeners can pick up on that, even if they’re not sure why it’s happening. 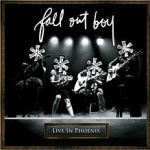 Following the success of Infinity on High and a sold out U.S. arena tour, Fall Out Boy releases their first live album **** Live in Phoenix. A DVD of an entire performance is released as well as a behind the scenes short film of tour shenanigans the band mates endure. The two-disc package debuted at number one on Billboard’s Music Video Sales chart. 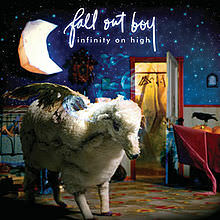 Moving away from their signature style, Fall Out Boy introduces funk and R&B into their third studio album, Infinity on High. 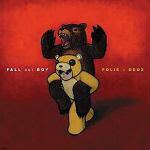 The album includes sinlges This Ain’t a Scene, It’s an Arms Race and Thnks Fr Th Mmrs. The record also includes collaborations with producers Jay-Z and Babyface. The new album is called Infinity on High. It’s taken from a quote by Vincent van Gogh. And as for what that means in relation to the record, we’ll just let it will unfold when people hear it. 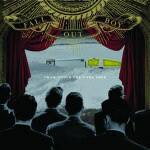 From Under the Cork Tree is released by Island Records along with the band’s breakthrough hit, “Sugar We’re Going Down”. 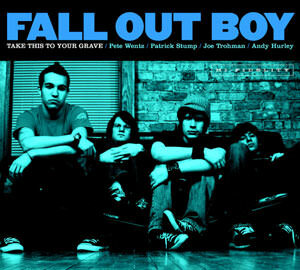 Unlike the rushed recording schedule put on the band for Take This To Your Grave, From Under the Cork Tree was recorded more gradually and was the band’s first album in which all songs were composed by lead singer, Patrick Stump, and lyrics written by bassist, Pete Wentz. The group signs to Fueled by Ramen, a subsidiary of Island Record and Warner Music Group.